A little over a year ago, I reviewed albums by Music For Voyeurs and I Am A Man With A St Tropez Tan, both solo projects by Rick Senley, otherwise using his skills as a photographer and novelist. This time I decided to make this a double review, because somehow, and just like last time, both albums share some common traits, making them some kind of companion albums. Let’s start with Music For Voyeurs, the mellower entity of the artist who is performing on electric guitar, piano, synthesizers and bass guitar, plus in charge of the programming and samples. He even adds a really nice trumpet touch once that adds a touch of dark jazz. The eleven songs make it to exactly half an hour, meaning that they are always quite short, and only the opener I’ve Given Up On Everything makes it over four minutes. The tracks come across like miniatures or vignettes, offering short glimpses into the possibly troubled soul of the artist, giving the whole endeavour a very naked and honest feeling. It seems to be that Senley is most adept at playing the guitar, which he does sometimes with a fervour that belies the otherwise intimate nature of the music. His piano playing has a more fragile quality, but fits quite well with what he tries to convey. Only the occasional synth strings feel a little deranged, and not in a good way. 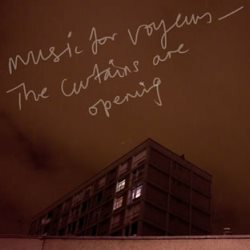 Apart from that, The Curtains Are Opening is a truly interesting album full of introspection, with my personal highlight possibly being 55 And From Wales where spoken word samples display the despair of people trying to find mates over a phone line. Weird stuff indeed! 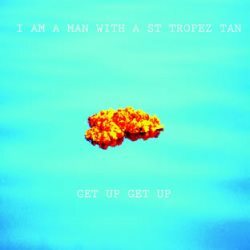 Moving on to I Am A Man With A St Tropez Tan and the album Get Up Get Up which, while being not totally different from what I wrote about before, comes still with a different vibe. The opener Scared To Wake Up is a four minute track full of different directions, and if I am not mistaken, sees Senley fooling around on the Korg Kaossilator quite a lot. That’s fun stuff! Otherwise we get this time only nine tracks that make it to a little over half an hour. Especially Back In The Park Again stands out with its nearly eleven minute running time. This is a very ambient track with wobbly synth chords that has a certain Eno flair. The instrumentarium is more or less the same than what we heard with Music For Voyeurs, but this time the electronic component is much stronger. There are moments that feel quite meta (Go On Rick Say Testing), touches of humour (Gay Bingo), and the concluding Auf Berlin even feels like a tribute to German techno. To get the most out of Rick Senley’s music, I advise you to get both albums, because one would leave you without the alter ego of the other, and your overall experience would be lacking. Music For Voyeurs is the introvert face of the artist, while I Am A Man With A St Tropez Tan is clearly his extrovert one. Better listen to the music on the homepages first, because this is experimental stuff after all, but for all those among you who like to explore sounds beyond the usual conventions of what is commonly accepted as and expected of music, this might quite well be an intriguing discovery.